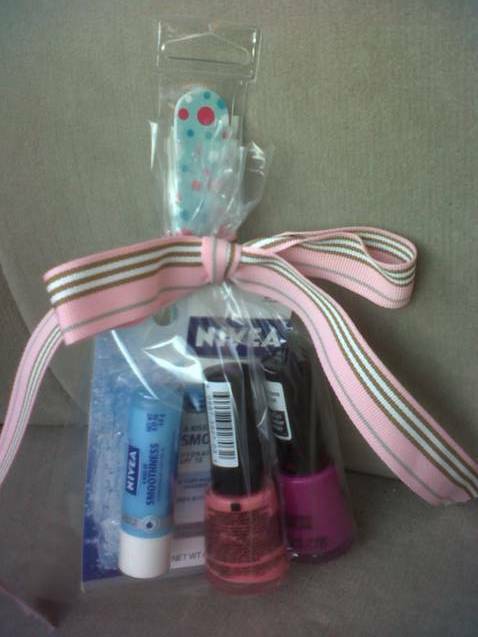 Last weekend I ran into the drug store to pick up some free after store reward bucks nail polish (on the list of things you can always get for free with coupons and store deals) and decided to use a few of them, plus a cute nail file and a lippy as a little nothing happy present for a sweet girlfriend. I am all about working to find my way back to joy this summer. And last week was a little rocky in that area for me. So I made a big, conscious effort to dig up lots-o-joy over the weekend. Do you know about Love Languages? (insert Bestie laughing) So one of mine is Gifts. Not elaborate gifts or expensive gifts. Usually homemade, to be honest. But I find great bliss in giving a little something to friends and family now and then. Just to let them know I love them. With my newly acquired and nearly free goodies on hand, I tossed a few in a cellophane bag and tied it with a bow. I knew my girlfriend would appreciate a little sursey just because. Just a fun treat to say happy summer to a sweet friend. Also, those nail polishes are supposedly scented once dried on your nails. I'll let you know next week after I use the two I kept for myself if Revlon is telling the truth or not. What a sweet gift. I haven't read love languages yet but am positive one of mine is gifts also. It's the littlest gifts/things that bring biggest smile to my face. Very thoughtful! Let me know if you really can smell the nail polish - that sounds interesting.